It has come to my attention that people get angry about Zelda video games. More recently, I went to E3, just last month, and filmed one of our interns play the demo for this fall's Wii game, The Legend of Zelda: Skyward Sword and I guess I got a smidge angry at him that he didn't know how to Z-target. And then, just yesterday, I shot a video of a Nintendo official playing the boss battle in that demo and, wow, so many people who commented on that story seemed angry about this game. Folks, the new Zelda is not an angering game. It's quite nice. And also maybe the most complex Zelda in a while? I played the dungeon part of the Skyward Sword demo yesterday so I could get more of a feel for the game. I do fancy myself a Zelda expert. I've played the NES Zeldas, the SNES one, the Game Boy Color Oracle duo, the N64 ones, the GameCube ones, the Wii one, and the DS ones. I've collected many rupees and found more boomerangs in treasure chests than a man should have to. I know my Zelda. This new Zelda has dungeons, of course. The one in the E3 demo, the Sky Dungeon, was locked on a 10-minute timer. The demo starts with Link in an enclosure that surrounds some sort of large bulbous room. The scene is colorful and bright, like you're inside the closed petals of a flower. 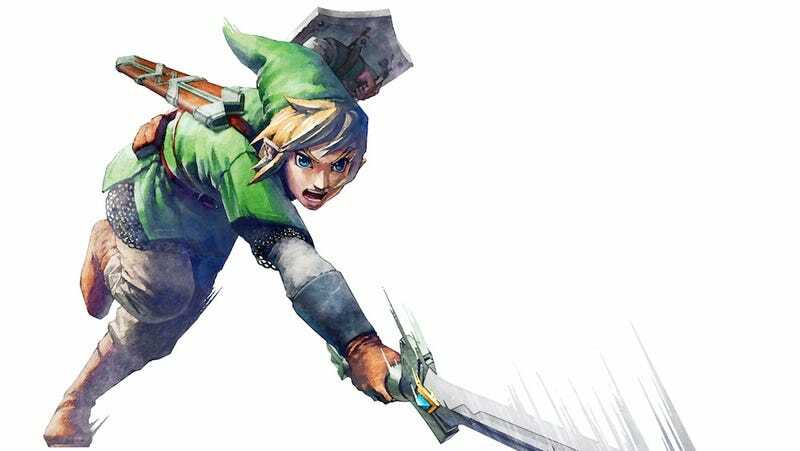 It was essentially an area rich with opportunities to test Link's moves against a variety of enemies. It surprised me when Kotaku readers reacted to the video I shot of the demo's boss battle in frustration. What they saw—what definitely exists in those controls—is something I didn't feel. They saw a delay between what the player does and what Link does. They saw lag and they didn't like it, knocking Nintendo for failing to deliver a 1:1 motion-controlled experience. Yes, there is a veryveryshort delay, but it's not a delay I felt as I played. I'd face up against an enemy in the dungeon, size up his stance, spot his vulnerable spot and strike. Not once did I feel that the window of opportunity close. You may see the delay. I see it now too. But in the swordplay it did not hamper the experience. I think this new Link will be trickier to control than earlier ones. When I checked a radial menu that shows Link's inventory, I saw that he was carrying three shields, one of them activated for battle. Each shield had its own durability meter. At times during combat a small green meter full of pie-shaped slices appeared. The shield meters represent how close Link's shields are to being broken. The pie-meter indicates Link's stamina, which can fade as he sprints or—and this is the one thing in the whole demo that worried me—when he's pushing boxes around to solve puzzles. A Nintendo rep who was showing me the game said that Link might have to sprint up a hill and the player will need to ensure that Link has enough stamina to do it. Not since Zelda 2 have I seen this many indications that we'll have to manage Link's vitality like this. It feels, for lack of a better term, more video game-y than Zelda has been in a while, which is not a turn I expected on the non-gamer-friendly Wii. I shouldn't have been surprised, I guess, considering the revelation at E3 that part of the game's terrain is doubled in a Link to the Past-style alternate reality. This is not a simple game. I ceded my control of the new Zelda dungeon to a Nintendo rep so I could take notes. I watched him race through a few basic puzzles (shoot an arrow at a gem to unlock a door; push a block, climb atop it and wave a sword to make some enemy eyeballs dizzy. Basic Zelda stuff. But I kept noticing a recurring theme: multiple ways to solve the same problems. There is, in this new Zelda a faint whiff of the tactical variety of, say, a BioShock. Zelda games have never been a one-solution-for-each-problem bunch of adventures, but Skyward Sword stands out. Inside the dungeon were giant spiders dangling from long single strands of spiderweb. In Ocarina of Time you wait for these guys to turn around and then strike their weak underside. In this new game, you can knock them side to side until they fall of their strand of web, the Nintendo rep told me. I tried something different: I unsheathed Link's remote-control flying beetle gadget and flew it, guiding it with the Wii Remote, in a loop until it cut through the spider's strand of web. The spider fell to the ground. I canceled the beetle's flight, flipped the spider over with the sword and struck. I got a signal that I could make a motion-controlled finishing blow. I did it. Link pounced on the giant spider and killed it. I guess I could have used arrows against the spider. I didn't get a chance to try. In other battles I found that I could use Link's shield to parry and daze opponents; for some puzzles, I saw, the arrow could be used or the beetle. I don't think Skyward sword provides as many different viable solutions to its combat and puzzle problems as a BioShock. But I do get the sense that the motion control in the game has forced its developers to create a world that is a little but less of a set and more of a system to which different acts of physics can be applied. This opens up the tactical options a bit and that, for a Zelda game, is exciting. Few Zelda games are bad and this one seems to me like it could be quite different and wonderful. The ways it veers from the established norms are the ways it most intrigues me. Skyward Sword didn't make me angry. It made me excited that this is not a safe Zelda, that it's an experiment.